Developing and marketing a product successfully in today’s environment is very challenging. This is the only industry where the primary customer does not pay for the product (with a few exceptions) and there are many decision makers. Conducting the marketing due diligence upfront in understanding the market can save a company time and money. Understanding the customers’ needs and what motivates them is the key to understanding the market place. In any market, there are many different customers that influences whether a product will be used or purchased and one has to understand those dynamics for product adoption. On a pain scale of 1-10, do your customers rank the problem you’ve identified as high pain point or critical unmet need? Does majority of the customers view your solution (product) as meeting a critical unmet medical need or solving a crucial problem? Who are your primary customer and what other customers can influence whether your product will be accepted or adopted in the market place? What is the political and economic dynamics between all customers involved? Does the product meet the motivation of all your customers? Who are your current and future competitors? Can you prove superiority for your product and is the clinical outcome a cost saving to the healthcare system? BioMarketing Insight can help companies answer these essential questions and more in assessing the commercial opportunity for new products by determining whether the product meets a critical unmet need and the marketing opportunity for the product meets the business goals of the company. We then develop initiatives to help ensure a successful market launch. The company has in-depth insight into the intricacies and idiosyncrasies of the industries in knowing which steps to take and what aspects need to be to overcome in being successful in the market. BioMarketing Insight brings a disciplined and deep perspective to the start of any project. The company has over 25 years of experience in the Biotechnology, Pharmaceutical, and Medical Device Industry in a number of therapeutic areas. The company specializes in Product Development, Market Development, and Marketing Strategies. Click on our newsletter tab for our monthly newsletter to read about market trends in the industry. 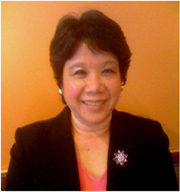 Regina Au is a strategic marketing consultant in the biotechnology, pharmaceutical and medical device industry working for companies such as Merck & Co., Genzyme Corp., The Clinipad Corp. and NMT Medical. She has been involved with the development of 6 new products and has successfully launched 7 new products. Her background includes an MBA in Marketing from the University of Connecticut, a Microbiology degree from the University of Michigan and a Masters in International Management from Thunderbird.